What is this day of free comic books I hear speak of? 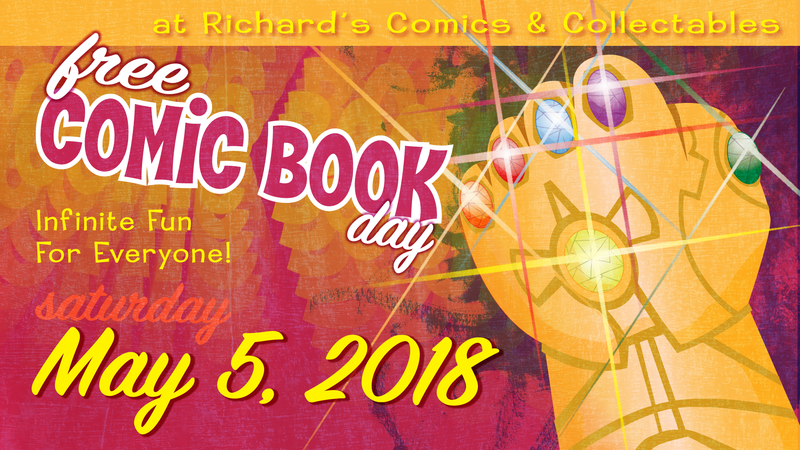 I, J Chris Campbell, will be returning to Richard’s Comics & Collectables again this year to celebrate the wonderfulness that is known as Free Comic Book Day (FCBD). Are you aware that the first FCBD was in 2002? Yes! That’s like over 15 years ago and there are still people who have never heard of it! Oh blessed day of comics that are free. But not you. You always remember It’s the first Saturday in May, right? Because you’ve been listening to me talk about it for over 15 years. No matter where you are you should have gone to at least one by now. Because most every comic shop participates in it to different degrees. Regardless where you go you’ll get some free comics of some kind. And NO, not all the comics in the store are free. They have select ones that they purchase to be given out exclusively on FCBD each year. Some of them go on to be sorta rare and collectable. But the majority are there to give readers a taste of what is available in the huge arena of sequential story telling. It’s vast smattering of styles and genre’s that will sure to delight readers of all age and types. Look for Creators sitting around making stuff. Don’t forget to look around for real living artists who will be on display for you to gawk at. We ask that you don’t feed them or poke them with large sticks. But they may be amilacable to drawing you a headshot or perhaps a rocket ship or maybe a super hero of your choosing. This year you can bask in the creative glory of these fantastic frolickers of fascinating imaginative flair. I feel certain that you will not be disappointed by the wonderful things they will be offering. You can purchase things directly from them or get a free sketch. And remember, it’s always nice not to be fickle when it comes to getting things for free. A great day for a marathon. 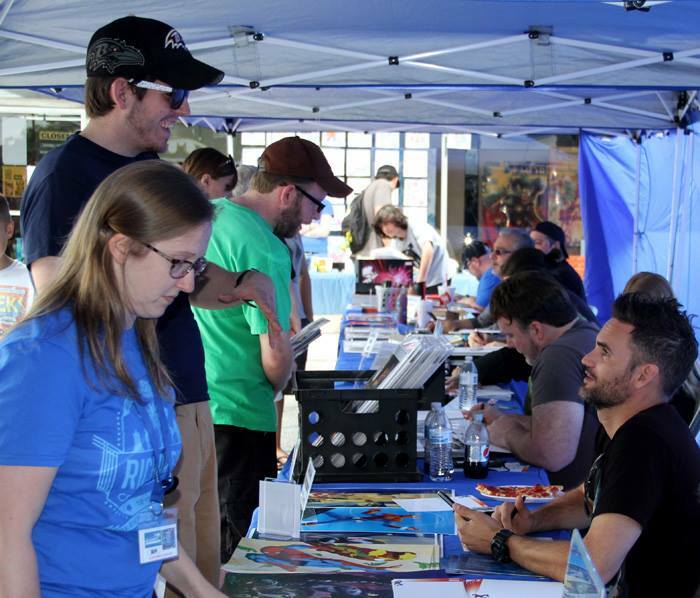 FCBD provides a perfect opportunity to draw at a rapid pace and complete large numbers of drawings that normally you’d never attempt doing. For the past 2 years I’ve done this and collected the drawings into books available at the next FCBD. I’ve drawn 50 robots and 50 spacemen all created on the spot, live in front of a lucky attendee. Each one is numbered, snapped a photo of and then passed on to be enjoyed. The photos are then edited into a collection and offered as a book to patrons of the event the next year. After weighing all my options I’ve decided to draw 50 Spaceships this year. It’s a weird thing to offer, but it fits with what I love to draw and I think it will work out fine. I’m sure someone will ask me to draw a famous ship or 2 that might require a quick peek at how they actually look. But I should be able to draw most ships in a cartoon form from memory. 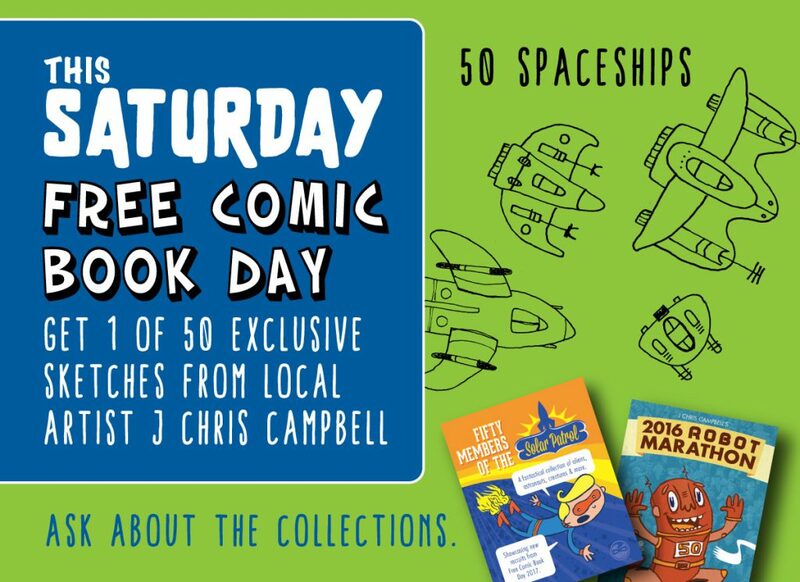 So get your hinnie to Richard’s and Comics and Collectables this Free Comic Book Day and pick up your very own limited edition spaceship that will be included in a publication celebrating this amazing day of Free Comic Books. I hope to see you and all your friends there. There is always more to do than get free comics and sketches. Richard does a great job of having plenty of extra things going on during the day. Including Kid’s Art Contest, Costumed Characters walking around and his always popular basement sale that is filled with old comic books all for just a buck a pop. 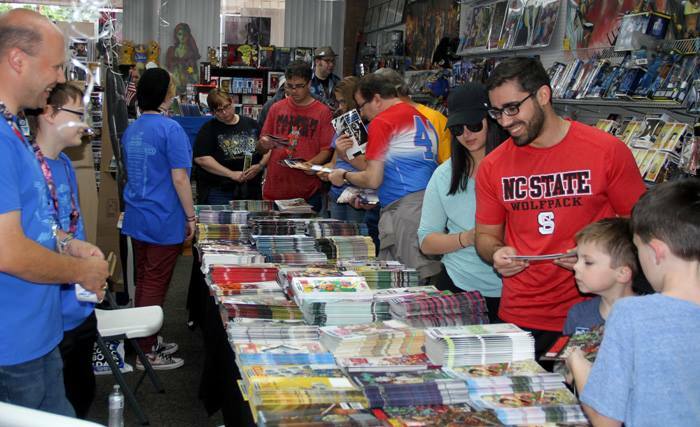 You could potentially come away with an arm full of great things to help broaden and strengthen your appreciation of comics. Or just have a good time hanging out with people who enjoy popular culture and all the stuff that supports it’s fandom. This event is for people of all ages and will make for a memory you will not soon forget. 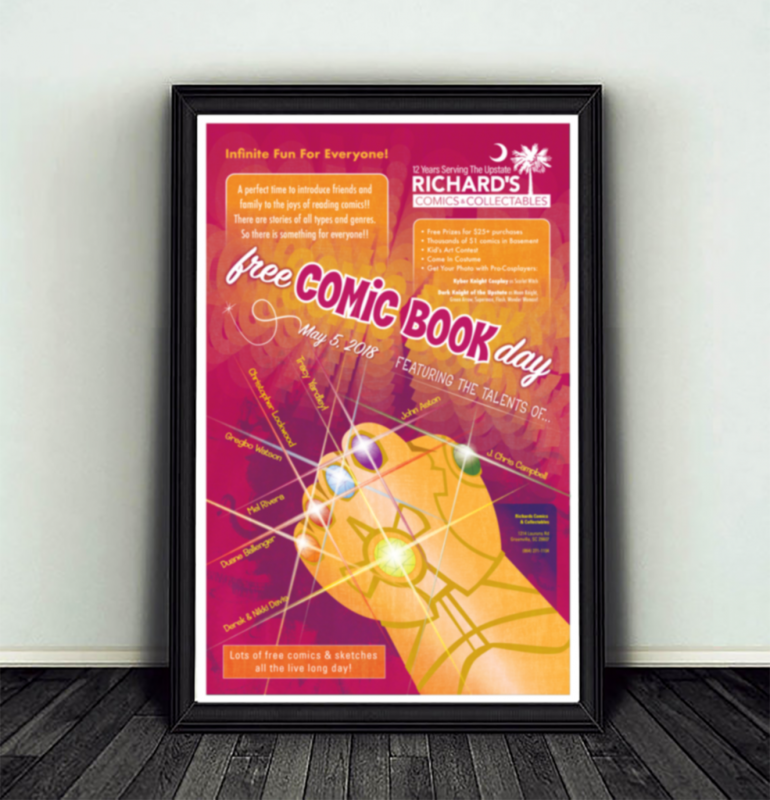 Grab a copy of the Free Comic Book Day poster that I designed for the event. You’ll have an opportunity to get it signed by each of the artists on hand. © 2019 J Chris Campbell. Built using WordPress and the skills he acquired fighting monsters under your beds.